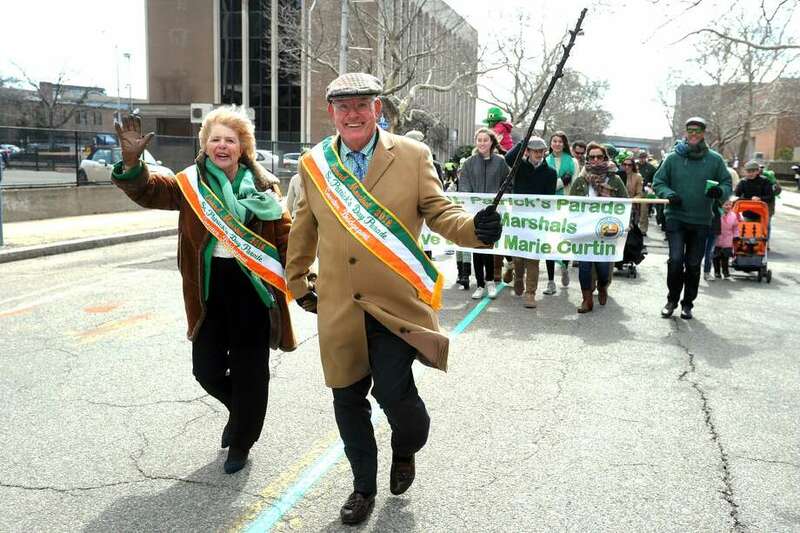 Grand Marshals Ann Marie and Dave Curtin, of Fairfield, march in the Greater Bridgeport St. Patricks Day Parade, in Bridgeport, Conn. March 16, 2018. As part of the new social studies curriculum, every child in third grade in the Fairfield Public Schools will visit the Fairfield Museum & History Center this spring. The third-graders spend the year studying the geography, government, economics and history of Connecticut and Fairfield, and their field trip to the Fairfield Museum is a memorable, hands-on way to supplement their in-class learning. While at the museum, students are able investigate many aspects of Fairfield and the area, including its early development and geography dating from the 17th century to today. Through scavenger hunts, gallery tours and activities, the students learn how people worked, lived, and built the community over time and how those developments have contributed to American history. In one activity on their field trips, students learn about ship captain Isaac Jennings, his family, and his travels at sea through a painting, actual letters, photographs, and his daughter Minnie’s doll. The Fairfield Museum is grateful for the support of the town of Fairfield, Fairfield Public Schools and the Community Development Block Grant (CDBG) program for making this field trip program possible. In addition, field trips to the Fairfield Museum are generously supported by Fairfield County’s Community Foundation, William T. Morris Foundation, Bankwell, and Bigelow Tea/David and Eunice Bigelow Foundation. Notre Dame High School recently received two grants from Foundations in Education last month to purchase 3D printers and in support of the school’s arts program. Foundations in Education, a nonprofit initiative created to help the Diocese of Bridgeport’s mission to support Catholic education in Fairfield County, awarded the grants through a competitive process. A $12,000 grant was awarded to Kathy Almeida, chair of Notre Dame’s science department and moderator of the school STEM Club to buy three 3D printers and related equipment. With the printers, students will participate in “The Helping Hand Project” which provided prosthetic devices to children in need. The second grant, totaling $4,800, was awarded to Sally Hong, Notre Dame’s Dance teacher. It will be used update the current sound system, purchase dance shoes, costumes, and props for future ND performances, and allow students to attend a Broadway show and take a dance workshop with a current cast member. The grants are among 19 awards totaling $105,000 that Foundations have given out in its first year. In all, 35 grant proposals were received from 19 of the 26 Catholic schools in Fairfield County. A grants committee reviewed proposals and submitted recommendations to Foundation’s Board of Trustees for approval. The committee is led by Julie McNamara, former President of Albertus Magnus College. An awards ceremony took place Feb. 1 at the home of the Most Reverend Frank J. Caggiano, fifth Bishop of Bridgeport and Acting Chairperson of Foundations in Education. To learn more about Foundations in Education, visit: www.foundationsineducation.org. A dozen Fairfield students earned recognition at the annual History Day Fairfield Regional Contest at Sacred Heart University. Hundreds of middle and high school students representing the area’s towns and cities competed March 17. Students completed research-based projects built around this year’s National History Day theme, “Conflict and Compromise in History.” They were able to submit projects into the following categories: exhibits, papers, performances, documentaries and websites. In the Junior Papers category, Fairfield Woods Middle School’s Lily Bolash earned first place for her paper on Caroline Ferriday. Brandon Faunce and Sophia Kessler from The Unquowa School earned first place in the Junior Group Documentary category for “The Untold Story of the Ravensbruck Rabbits. Also from The Unquowa School, Kelly Jones took first place with “Kent State: American Values in Conflict” and Adriana Giachino earned second place for “The History of the Alamo” in the Junior Individual Documentary category. State Sen. Tony Hwang and state Reps. Laura Devlin, Cristin McCarthy Vahey and Brenda Kupchick were on hand to present medals to students during the event’s Awards Ceremony. Students who placed within the top three in their category will now move on to the Connecticut History Day State Contest at Central Connecticut State University April 28. Support for the CHD Fairfield Regional Contest comes from the contest’s host, Sacred Heart University. Funding was provided by HonorBound, the Retired Teachers of Fairfield and an anonymous donation made in the memory of the late Barbara O’Brien, a teacher at Tomlinson Middle School. A Fairfield pizzaria is giving back to the community with a “Good Neighbor Day” program. On March 26, Frank Pepe Pizzeria Napoletana of Fairfield, located at 238 Commerce Drive, will donate 10 percent of all lunch and dinner sales to Operation Hope. Built on a family tradition of hard work and customer loyalty, Pepe’s has long been inspired to help support their neighbors. Knowing its success comes from the community’s love of Pepe’s coal-fired pizza pies, the restaurant is thrilled to help the neighbors who have made Pepe’s such a great place. While eating for a special cause on “Good Neighbor Day” from 11 a.m. to 10 p.m., guests are welcome to enjoy a variety of classic creations from Pepe’s such as the fresh white clam pizza and Frank Pepe’s original tomato pie. Founded in 1925 in New Haven, locations now include Fairfield, Manchester, Danbury, West Hartford, Waterbury, and Uncasville, Yonkers, N.Y., and Chestnut Hill, Mass. Cindi Bigelow, president & CEO of Bigelow Tea, will receive the 2018 Caroline House Award for her support over the past decade of programs that benefit low-income women and their families by providing literacy training and life skills. Founded in 1995 by the School Sisters of Notre Dame, Caroline House has a mission of helping immigrant women and children to reach their full potential through education in the English language and life skills. To date, more than 1,600 women and children have been served by the Bridgeport center. Caroline House is one of 21 local nonprofit organizations that receive funds raised through the annual Bigelow Tea Community Challenge. Since it began 30 years ago, the Bigelow Community Challenge has raised more than $1.5 million for organizations that provide shelter, food, educational services, counseling, crisis management, after-school tutoring and recreational programs. Bigelow will be honored at the center’s Starry Night Gala on April 6 at the Inn at Longshore in Westport from 6:30 to 11 p.m. The evening will include cocktails, live and silent auctions, dinner, music and dancing. Tickets are $195. For more information, visit thecarolinehouse.org or contact Christine Paine at cpaine@thecarolinehouse.org. Bigelow is the third-generation president and CEO of family-owned Bigelow Tea, the U.S. market leader of specialty teas that produces more than 2 billion tea bags annually. She holds a Bachelor of Science from Boston College, an MBA from Northwestern University’s Kellogg School of Management, and honorary doctorates from the University of New Haven and Fairfield University. Socially- and community-minded, she frequently makes appearances, speaking to students and industry leaders and sharing insights on business ethics and career development. She has received numerous awards for her years of community service.